This useful report will help you adjust the number of agents you need to cover all of your chats. Using the data about the number of chats you are getting, the staffing prediction report will suggest the optimal number of agents required to handle all of your chats. The report takes into account the number of simultaneous chats your agents can handle. 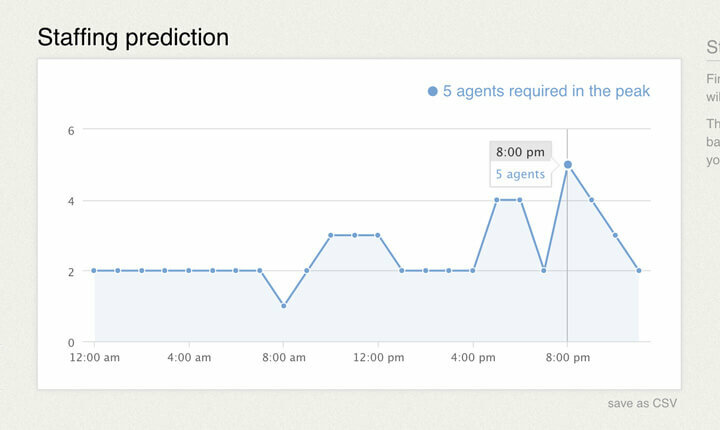 After you change the number of chats your agents can handle, the report will show updated data. If you notice that the number of your agents is slowly becoming too small for the growing number of chats, you should consider adding more agents or increasing the number of simultaneous chats your agent can handle. Please note that the more simultaneous chats your agents have to handle the harder each chat gets. Getting more agents may be preferable here, especially if your agents are already running several chats at a time. Staffing prediction report is available from our Business and Enterprise plans. The staffing prediction algorithm will try to assign all the chats to agents so that no clients have to wait in a queue by using the Least squares method. The algorithm needs at least four weeks of data to make a suggestion. It only considers the last four weeks too. It takes into consideration the chat limit of your agents, but not administrators or owners. Usually, those managerial accounts are used to supervise and manage various settings and don’t chat much. Only if you have only Owner or Administrator accounts set up, those accounts will be considered in the staffing prediction. There is also a buffer built in that leaves a 10 percent gap between the maximum number of chats and the actual number of handled chats. This will help you avoid situations where one longer chat will force other visitors into a queue.